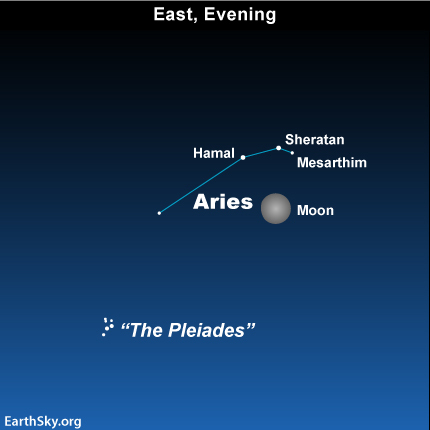 The moon shines in front of the constellation Aries the Ram tonight. But the glare of the almost-full waxing gibbous moon will make the mighty Ram look sheepish in the moon-drenched sky. The moon will turn full on November 21. This will be the third of four full moons to fall in between the September equinox and the December solstice. Generally, there are only three full moons in one season, so the third of four full moons is sometimes referred to as a blue moon. You may be familiar with the much more popular definition: the second of two full moons in a single calendar month. In a week or so, the moon will drop out of the evening sky, giving you the chance to see the Ram in all its glory. According to the lore of the heavens, this supernatural Ram could speak and reason. On today’s chart, notice the tiny, but significant Ram constellation, Aries. It is small, but it is easy to find on a dark, moonless night, because two of its stars are of medium-brightness and are close together. 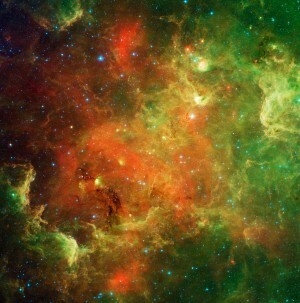 But you may need binoculars to see these stars tonight. Sheratan – the middle of the three stars above the moon – marked the location of the vernal equinox about 2,000 years ago. You might try to find Aries tonight in relationship to the tiny dipper-shaped cluster Pleiades. As always, a moon-free night and a dark sky will enhance the view.